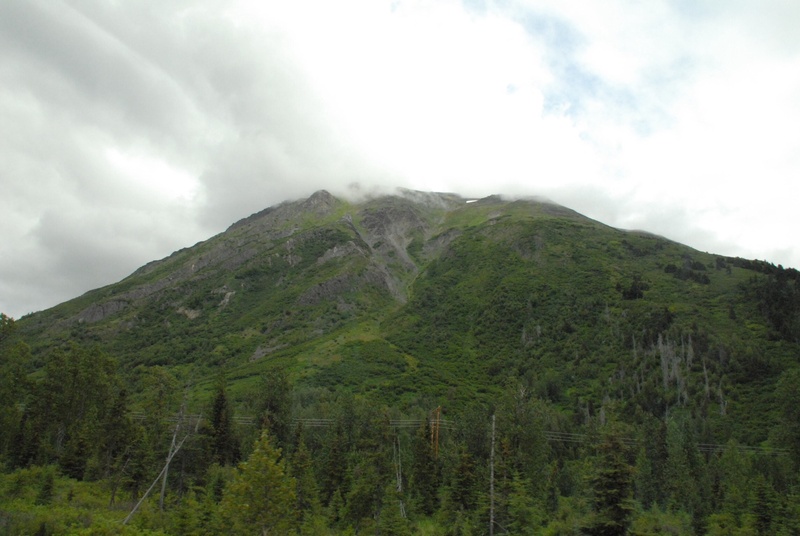 It’s an exciting time on the Kenai Peninsula. 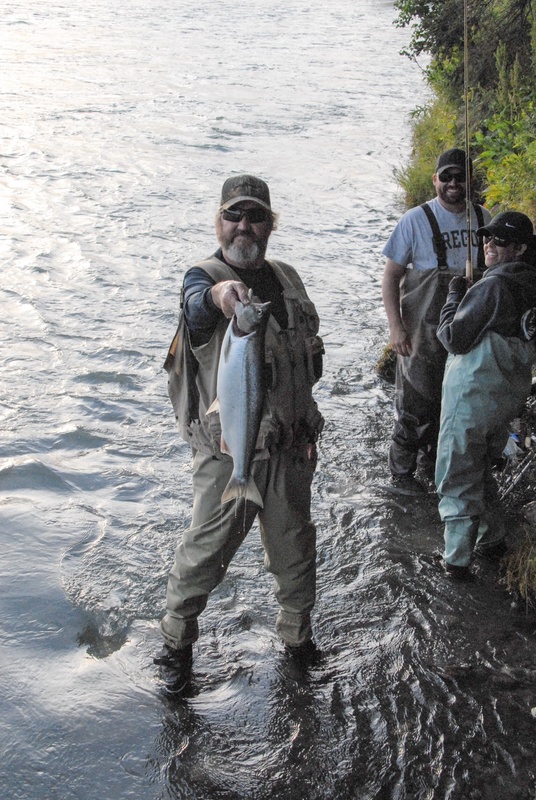 The red sockeye salmon come into the rivers by the hundreds of thousands, some say over a million, swimming upstream, headed to the spawning grounds. 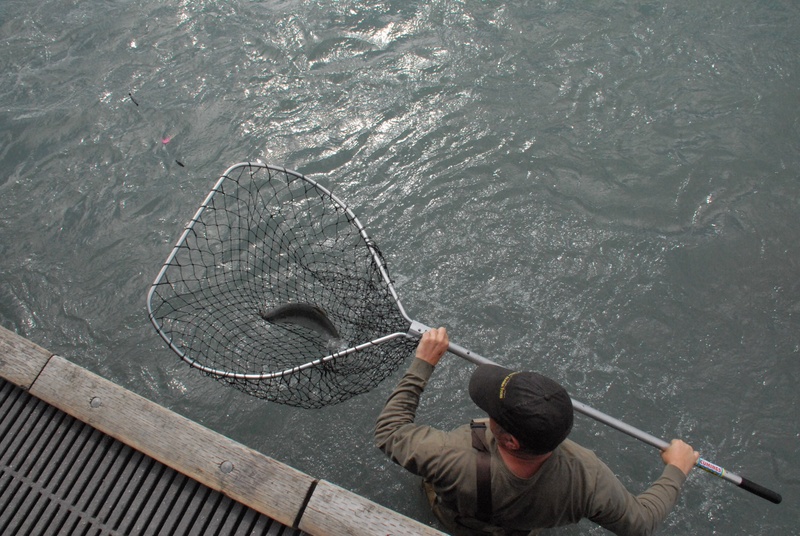 People line the rivers with dip nets, or specially designed rod and reel rigs, to catch them. 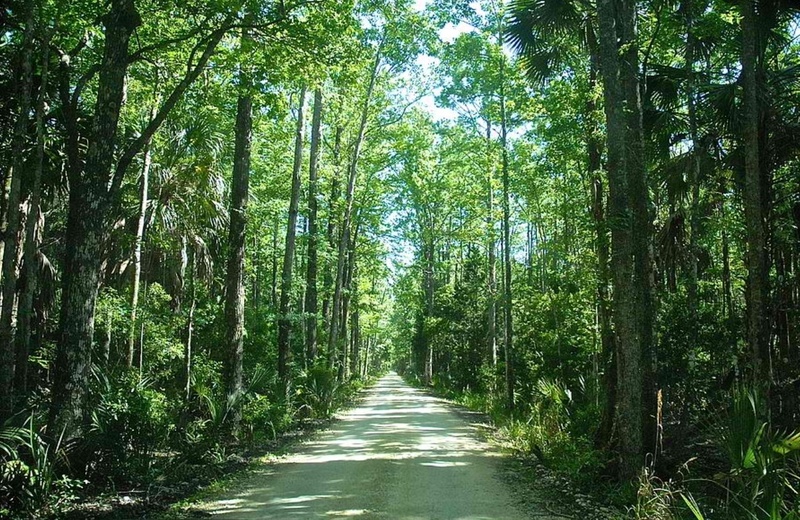 The limit is normally three per person per day, but during the strongest point of the run, it is increased to six. They weigh on average nine to twelve pounds. 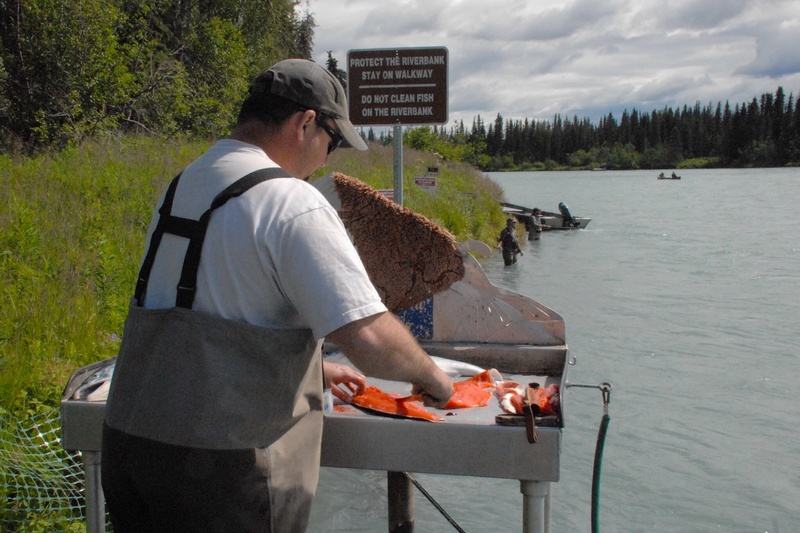 For the last few days the fishing on the Kenai River has been strong, but the catching, slow. 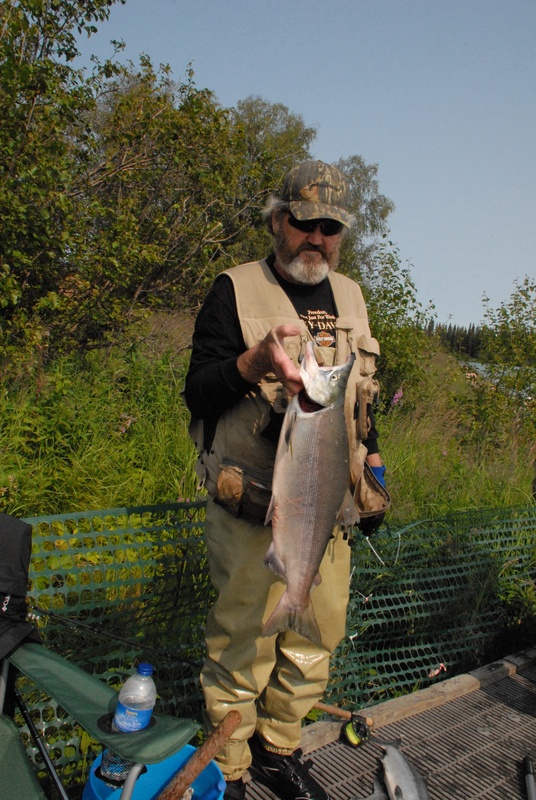 Many showed up and fished, from twelve year-old children to seventy-five year old men and women. And they came from all over: Wisconsin, Michigan, Louisiana, Texas, Florida, and elsewhere. Some caught the limit, but it took half a day to do it. Others walked away with nothing. This gentleman caught his limit and was cleaning them at the station provided for that purpose on the dock. The word was out this morning that the “run is in.” In other words, the bulk of the red salmon is in the river now and headed upstream. I was told earlier in the week that when this happens, you could almost walk across the river on them, there are so many. I suspect today will not only be a strong fishing day, but a strong catching day. There is a special way to fish for these, nothing like we fish in Florida. They are caught by hooking them in the mouth totally by chance. They do not feed, so they are not biting. They are swimming; your hook just happens to be going by them as they swim and hooks them. I know, crazy. Some fishermen have a knack for it though and if the red are out there, they will catch them. 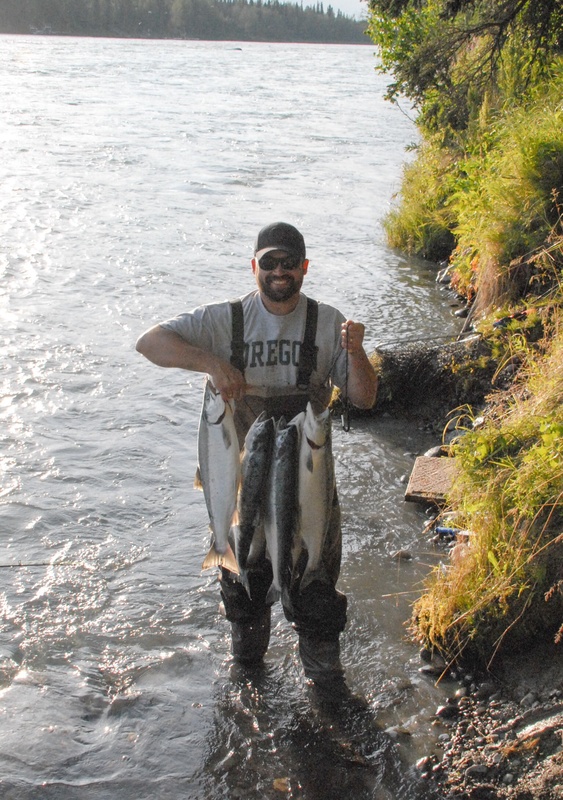 When the catching is slow, the fishermen stand out there and do the “Kenai Flip” for hours on end hoping to hook one. 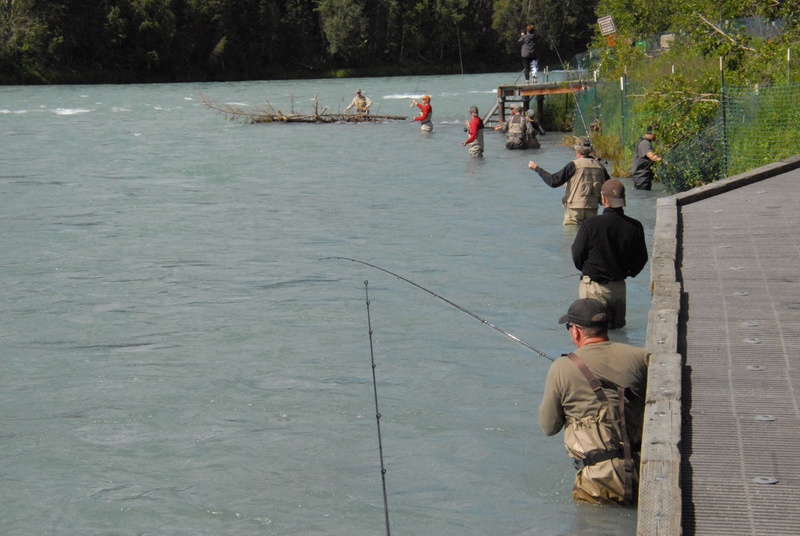 The “Kenai Flip?” You stand in the water, flip your line upstream, and let it drift downstream past you. The lead weight located on the line about five feet up drops to the bottom allowing your fly to float up, hanging there for the unwary salmon to run into. When the line is fully extended about ten feet past you and you have no tug on it, you pull your line with your left hand and flip your rod tip back to the right, bringing the lead, hook, etc. back to you. Then the process starts over. If you do snag one, the fight is on. You can only keep them if they are snagged in the mouth. A fish hooked in the mouth is easier to lead in than one snagged elsewhere, but still likely to be a fighter. A dip net is a must. Landing the fish is easier with two people: one to reel and one to dip. 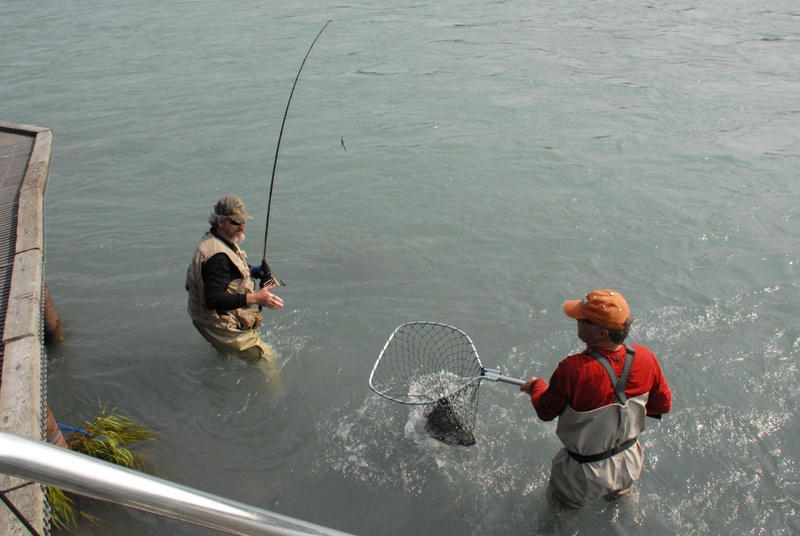 Perfect strangers grab a dip net to help land a fish. It is exciting and refreshing to watch. R. Miller and his wife catch their limit. My husband, Frank, was happy with his first catch! Looking to load up today!